According to the Wellesley Institute, Canada is the only developed country with a universal healthcare programme which does not include access to prescription drugs. Thus, while Canadians don’t need to pay to see their doctor, prescription drugs are not covered by the universal healthcare programme. And they are some of the highest priced in the world, with patients’ out-of-pocket expenditure on prescribed drugs amounting to $3.6bn annually. PSI affiliate the American Federation of Teachers is encouraging pension funds to consider avoiding private equity investments in companies that profit from mass incarceration. For the last few years, the 75,000 members of the Quebec health care workers’ union, the FIQ, have been campaigning for the government to allow them to provide quality and humane health care. A lot of problems can be avoided by having stable well-staffed work teams. This side event to the UN High Level Political Forum on Sustainable Development, co-sponsored by PSI, will focus on recommendations to “value water”. Using a rights-based lens, panelists will explore the ways in which water is valued in communities, cultures and faiths around the world exploring the ways in which market-based strategies have distorted these long-held values and further marginalized segments of the population. Detroit is the largest city to file for bankruptcy in United States history. But it is not the only city in economic crisis, and what happens in Detroit matters—it matters to AFSCME members who have dedicated their working lives to providing quality public services to the city and community, it matters to workers and retirees across the United States and around the world, it matters to all public sector workers who we depend upon to provide quality public services to citizens around the world. Detroit matters to all of us and we stand in solidarity with the workers and retirees of the city. The executive board of PSI has expressed support for students in Quebec. In view of International Women’s Day on 8 March, PSI is reviving a debate about pay equity presented in the study entitled: “Ontario Pay Equity Results for CUPE Service Workers in Ontario Hospitals: A Study of Uneven Benefits” written by Jane Stinson, a Canadian political economist. PSI has joined a growing number of voices pointing out that the new wave of so called “trade agreements” no longer have much to do with trade. Rather, these secret agreements create binding laws, away from democratic parliamentary institutions, to give rights to foreign investors and the largest multinational corporations on the planet. The PSI North America Binational meeting was held on March 4, 2016 in Ottawa and hosted by the Public Service Alliance of Canada (PSAC). Robyn Benson (PSAC), the Canadian titular, and Candice Owley (American Federation of Teachers-AFT), the United States titular, co-chaired the meeting. This meeting followed the Canadian SUBRAC and the United States SUBRAC, both held on March 3, 2016. A proposal by the US Trade Representative (USTR) dated 25 April 2014 to the Trade in Services Agreement (TISA) negotiations has been leaked. It focuses on e-commerce, technology transfer, cross-border data flows and net neutrality. Many international trade and investment agreements give individuals and corporations who invest in other countries access to a special legal procedure that can challenge domestic policy decisions in private tribunals. Investors—meaning anyone who buys property in a foreign country, from a hectare of land to stocks and bonds—can use “investor-to-state dispute settlement” (ISDS) to sue governments over laws, regulations and even domestic court decisions that affect current or future profits. You can think of ISDS as establishing special “corporate courts” that have their own rules and that a country’s own citizens cannot use. Download our posters and speak out and take a stand against racism and xenophobia! PSI-North America was very busy in the last week of January with a series of meetings to more effectively coordinate the work among affiliates and PSI. Download a PDF of the report. PSI Canadian and United States affiliates gathered in Washington, D.C. on January 30, 2014 to discuss the attacks on labor rights in North America. This position paper produced by the Utility Workers Union of America, AFL-CIO, is an assessment of restoration efforts and gives recommendations for the future. A discussion of what trade unions should know about options within the multilateral system - This one-day strategy session – taking place on the sidelines of the UN HLPF - will bring experts in financial regulation and corporate governance from academia and the UN system together with representatives from trade unions and CSOs. This side event to the UN High Level Political Forum on Sustainable Development, co-sponsored by PSI, will discuss the activities and strategies of private sector actors towards the SDG implementation. Does private sector involvement lead to more sustainability, the implementation of the SDGs and positively affect business models and behavior in the long run – or not? The authors of the Spotlight Report 2018 Exploring new policy pathways: How to overcome obstacles and contradictions in the implementation of the 2030 Agenda will present key findings and recommendations to participants for discussion. The Future is Public is a two-day gathering of union leaders, activists, researchers, and community groups designed to share ideas and proposals around building a pro-public movement in Canada. PSI North American affiliates from the USA and Canada will be meeting in Washington 14-15 June. The meeting has a heavy agenda before it with a special focus on anti-privatization campaigns and trade issues. As part of its global campaign for tax justice, PSI is co-hosting a side-event on 16 February at the First Global Conference of the Platform for Collaboration on Tax. The side event will focus on The role of tax policy in reducing intersecting inequalities and achieving the SDGs. PSI is part of the trade union delegation attending the two and a half days meetings with the IMF and World Bank and will be represented as a discussant in the session on "Joint work towards universal social protection and healthcare"'. 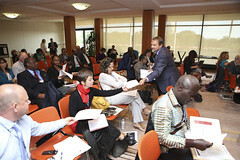 The Civil Society Policy Forum (CSPF) has become an integral part of the International Monetary Fund and World Bank Group Spring and Annual Meetings, providing an open space for Civil Society Organizations (CSOs) to dialogue and exchange views with World Bank Group and IMF staff, their peers, government delegations, and other stakeholders on a wide range of topics. The 59th session of the United Nations Commission on the Status of Women (CSW59) will take place at the UN Headquarters, in New York, from 9th to 20th March 2015. Morna Ballantyne, Public Service Alliance of Canada explains that the PSAC has launched an important campaign in defence of the sick leave provisions enshrined in their collective bargaining agreement. "Agreement by agreement the policy space for governments is diminished then workers who live in democracies find out that their democracies can't be as responsive as they should be. [...] These kind of agreements cannot be made behind the workers backs, behind closed doors" says Celeste Drake, keynote speaker at PSI’s Global Trade in Services Forum, From GATS to TISA, held in partnership with the Friedrich-Ebert-Stiftung (FES) and the Our World Is Not For Sale (OWINFS) network. 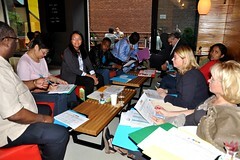 PSI, affiliate leaders and partners convened in Washington, D.C., 15-17 September 2014 to discuss the new threats posed to workers, public services, democracy and our communities by trade and investment agreements. Public services unions worldwide are determined to open to public scrutiny a new wave of global trade agreements, which are now being discussed behind closed doors. 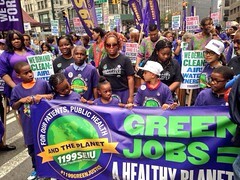 Listen to the RadioLabour report on PSI's Global Trade Summit. Listen to Deborah James', Director of International Programs Centre for Economic and Policy Research, analysis of the results of 30 years of liberalization and how the new wave of trade agreements limit the role of government and deepen corporate power. PSI at the UN High Level Dialogue on Migration and Development and the Peoples Global Action on Migration, Development and Human Rights, New York (USA), 30 Sept - 4 October 2013. On Saturday 10 March 2012, 62,000 Wisconsinites returned to the Capitol to mark the one year anniversary of the passage of Gov. Walker's union-busting bill. Giant squirrel + ground beef = sick! This time, meat inspection is being ransacked. Canadians rely on people like meat inspectors to ensure the food we buy is safe to eat. If you knew inspections were about to be compromised by budget cuts...wouldn't you do something about it?